Using exclusive analysis, the EPC has produced an important insight into the impact that Brexit will have on UK engineering research. The findings are far-reaching and disturbing. A briefing is available to download, and below we have examined in additional depth some of the implications for different engineering disciplines and regions. Higher education engineering is a major internationally recognised and competitive UK asset. Engineering relies on non-UK collaboration more than most academic disciplines in terms of both research projects and attracting experts from all over the world to research, study and teach in the UK. Our university engineering departments have higher proportions of international researchers than the average for all subjects and the ability of the UK to attract the best researchers in a field is critical to the maintenance of the UK’s excellence in research and higher education. Engineering research addresses global issues, for which international and EU partnerships are critical to the effectiveness and impact of the work. It is precisely this emphasis on collaboration and engagement with non-UK partners which renders engineering more dependent on EU research funds than the sector as a whole, with EU research funding representing nearly £1 in every £5 of all HE research grants and contracts income in engineering (18.9% of Engineering compared with 14.9% across all subjects). 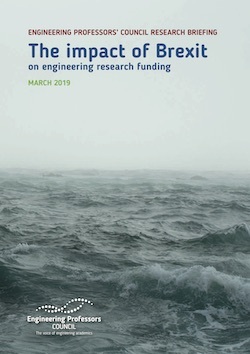 To assess the risk to vital research links and funding presented by the UK’s pending exit from Europe, the EPC has analysed a range of scenarios resulting from a reduction in universities’ research grants and contracts income from the EU (using 2016-17 HESA data as a benchmark), with a focus on the impact of losing European funding. You can download the briefing here. Additionally, below we have examined in greater depth some of the implications for different engineering disciplines and regions. EPC members can also download a (password protected) dynamic extract of the HESA data used for this analysis. Included here is a brief summary of the distribution of EU funds, by discipline, across the UK regions in 2016-17 (EPC analysis of HESA Finance Record 2016-17 Table 5 using Heidi Plus Online Analytics service). Overall, UK HE engineering departments attracted £208.6 million of European research grants and contracts funding in 2016-17. Table 1 shows the proportion all research grants and contracts income in engineering which came from the EU in 2016-17 and distribution of the £208.6 million, by discipline. While Mechanical Engineering (representing £40 million of this pot) aligned quite closely to all academic subjects, IT, Systems Sciences & Computer Software Engineering relied on more than double the sector baseline proportion of EU funding in 2016-7 (income > £48 million). Electrical, Electronic & Computer Engineering and General Engineering also saw relatively high EU research grants and contracts dependency and levels of income (21.4%, £45.8 million and 17.5%, £35.1 million, respectively). Both measures were less pronounced for Mineral, Metallurgy & Materials Engineering, Civil Engineering and Chemical Engineering (between approximately £12 and £15 million and 15-16%) but it’s worth noting that these disciplines were the most dominated by Russell Group universities (94.3% of 14.6 million), Civil Engineering (80% of £13.6 million EU research income in 2016-7) and Chemical Engineering (68.9% of £11.9 million). Overall, Russell Group universities dominated the receipt of EU research grants and contracts funds across all engineering disciplines attracting a total of £131.1 million (68.6%) in 2016-17. Just four Russell Group universities accounted for 30% of the EU income. In the North East and in Yorkshire and the Humber, the Russell group accounted for over 90% of successful EU research grants and contract income awarded. However, there is an overall greater relative dependency of non-Russell Group universities on EU funding in engineering (and notably in General and Chemical Engineering) particularly in some regions. Collectively, this cohort accounts for £77.5 million of EU research funding in Engineering, most notably in General Engineering and IT, Systems Sciences & Computer Software Engineering. In particular, we highlight the reliance of IT, Systems Sciences & Computer Software Engineering on EU funding. This is of particular concern given the UK’s Industrial strategy, to which engineering is critical. UKRI has invested significant funding in robotics and AI in recent years, with this funding focused on a limited number of key areas, such as extreme environments. In 2018, a £10M fund was made available by UKRI for collaborative research and development in the general field of robotics and AI. Despite its broad field, this equals the EU research grants and contracts income achieved in the South East alone in one-year in IT, Systems Science and Computer Software Engineering departments and there is therefore considerable risks to many important areas of research, which may not currently be receiving significant funding from UKRI. 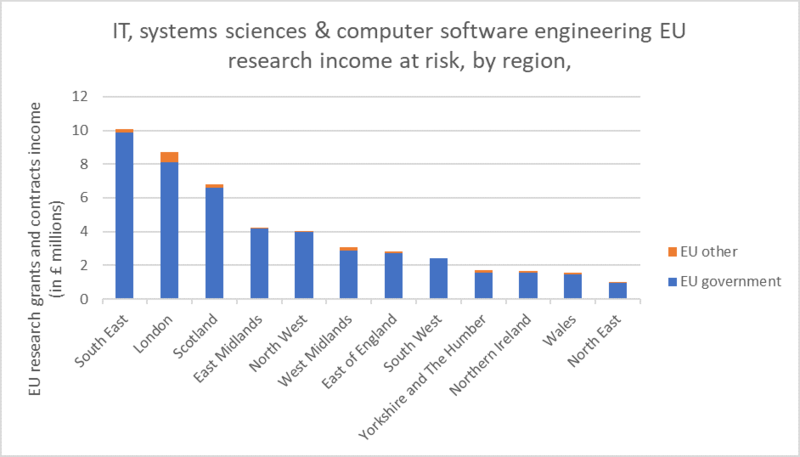 EU funding of IT Engineering research is a widescale risk, with an impact on 86 UK universities (and almost all of EPC’s members). However, more than half of this financial risk (£25.6 million) is shared between the South East, London and Scotland (see Table 2). Non-Russell Group universities account for more than two-fifths of total income in this discipline, but in the Midlands, over half of this income generated by non-Russell Group IT, Systems Sciences & Computer Software Engineering departments (with a value of over £5 million) was EU funded. This is not an insignificant sum and is focused on a number of key stakeholder universities. Electrical, Electronic & Computer Engineering also relies heavily on European research grants and contracts income (Table 3) with Non-Russell Group universities generating £17.9 million and Russell Group members generating £28.0. 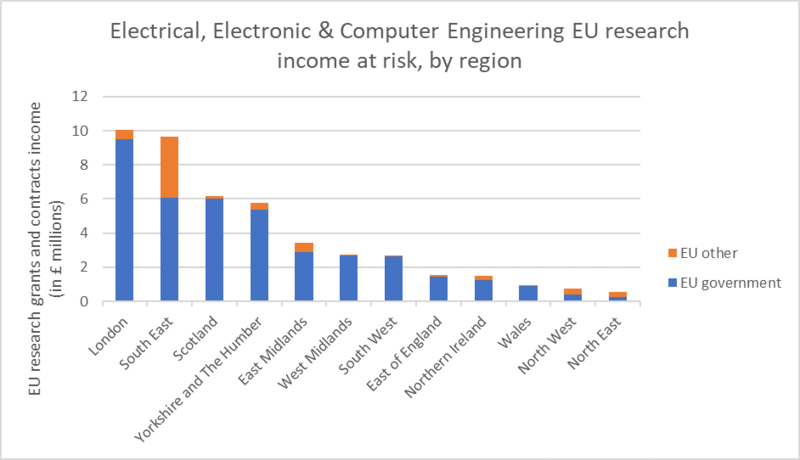 Relative risk among non-Russell Group Electrical, Electronic & Computer Engineering departments in the West Midlands was notable – these attracted £2.1 million of the £2.7 million EU funding in this region and discipline. Electrical, Electronic & Computer Engineering witnessed an uncommonly high dependency on non-Government based sources of EU income among non-Russell Group universities . Further analysis shows that just one university accounted for over half of the EU other income in this discipline, highlighting that at this level of detail, any regional or Russell Group bias is, in practice, governed by a handful of sector experts. In fact, many of the observations below draw on individual or a small number of universities’ relationships with local businesses, highlighting that UK university Engineering departments are providing important support to regional industries. London and the East of England (Mineral, Metallurgy & Materials Engineering (Table 8). Also of note: In the North West, 70% of all Mineral, Metallurgy & Materials Engineering research in non-Russell group universities was EU funded (£0.25 million) in 2016-17. Over half of Russell Group research funding in this discipline in the South West was also European (over £0.75 million). The EPC understands that it is crucial for universities to be supported to understand their own engineering research grants and contracts vulnerability. To this effect, we have published a dynamic extract of the HESA data used for this analysis in the members area of the EPC website to enable our members to conduct their own analysis. Limited HESA finance (and EU staff) data for the previous year (2015-16) at institutional level is available (until July 2019) to subscribers of HEIDI plus through the Jisc and HESA Community dashboard: Brexit implications on Research. This provides student data at cost centre (Engineering discipline level) . Please contact your university HEIDI plus lead contact to arrange access (the EPC is not able to provide access directly). HE providers’ income is submitted (by mandate) by each HEI through an annual Finance return. HESA analyse the data by six main sources, of which Research grants and contracts is one. https://www.hesa.ac.uk/data-and-analysis/providers/finances. In 2016/17 UK HE providers generated £5.9 billion of income from Research grants and contracts. £877 million (14.8%) of this was from the EU. 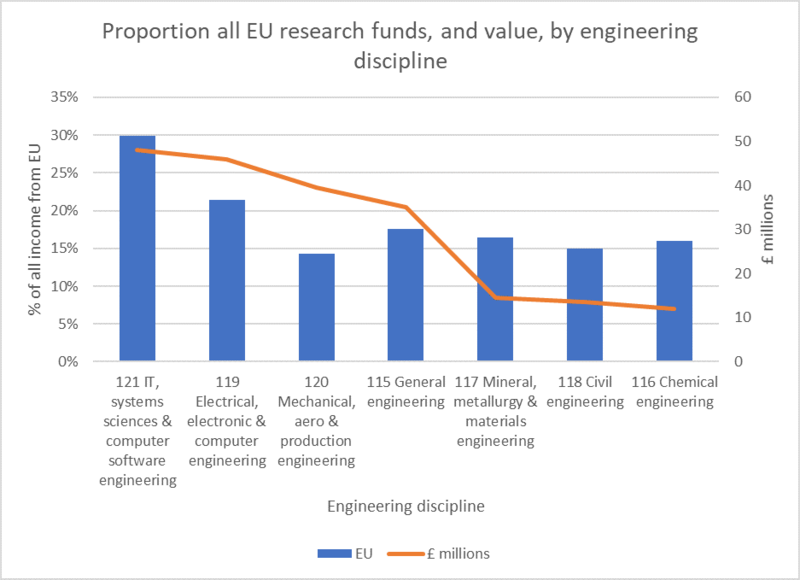 Engineering accounts for almost one-fifth of all UKHE Research grants and contracts income (£1.1 billion) of which £208.6 million (18.9%) was from the EU. HESA publish summary income and expenditure of HE providers at https://www.hesa.ac.uk/data-and-analysis/providers/finances and in HE Finance Plus and Finances of HE Providers.